Harpoons with a bone tip were used to hunt seals, dolphins and sea birds. Tierra del Fuego, Spanish for “Land of Fire” is an archipelago located off the southernmost tip of the South American mainland, across from the Strait of Magellan. 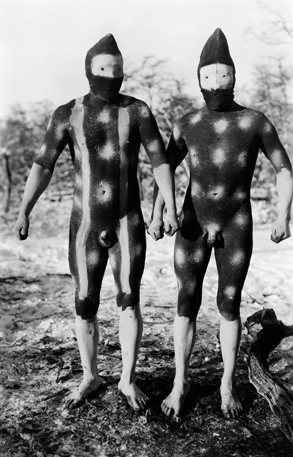 The nomadic tribes native to the islands, including the Selk’nam, Yamana, and Kawésqar, have lived there for more than 10,000 years, creating cultures and ways of life that have all but disappeared, due to both the endemic infectious diseases carried by Westerners, as well as by the militias paid by Europeans to erase the native population on well-organized human hunts. The Shoort spirits Télil, representing the sky of rain (northern sky), and Shénu, representing the sky of wind (western sky). 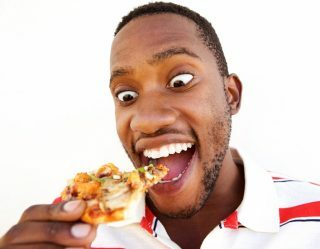 Such extraordinary hubris seems pathological of the race that declared for itself the “white man’s burden” of “civilizing” native populations by employing their long-held foreign policies of genocide, pestilence, and psychological warfare. We are deeply fortunate that Martin Gusinde, a German priest and ethnologist, took an entirely different approach. 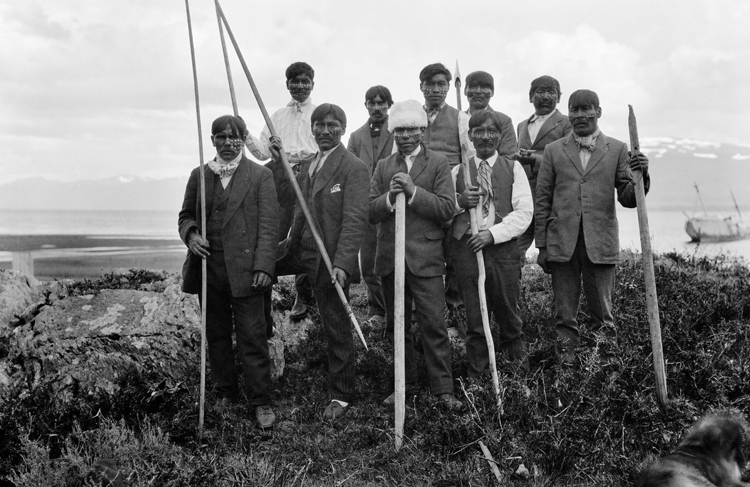 In 1919, Gusinde was sent as a missionary to Tierra del Fuego, with the aim to convert the natives to Christianity. Instead, the opposite took place: Gusinde was one of the first Westerners to be initiated into the sacred rites of the native people. Ulen is a clown-like male spirit, whose role is to entertain the audience of the Hain. photographs, which he produced in a portable darkroom. 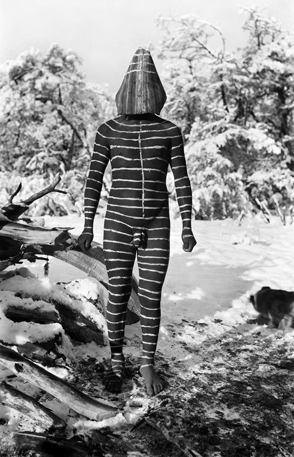 These photographs are collected in The Lost Tribes of Tierra Del Fuego: Selk’nam, Yamana, Kawésqar, photographs by Martin Gusinde, edited by Christine Barthe and Xavier Barral (Thames & Hudson), an extraordinary volume of photographs reproduced in sumptuous tritone. The Lost Tribes of Tierra Del Fuego presents the people and their way of life, a way of life that has all but disappeared but for these photographs. Gusinde meticulously documented the tribes’ rituals and practices, which are revealed here. His straightforward approach to photography, when combined with the sacred costumes and makeup of the tribes, take on an ethereal, otherworldly energy that makes the work that is at once beautiful, lyrical, and haunting. In his fourth and final trip in 1923, Gusinde took part in the Hain ceremony, and brought his camera along. We are fortunate for this, for the Selk’nam Genocide would decimate the population from 4,000 to 100, with the last full blooded member dying in 1974. Thus, The Lost Tribes of Tierra Del Fuego becomes more than a monograph, it becomes a memorial to a people and a culture that were vanished from this earth. All images © Anthropos Institute, Sankt Augustin, Germany. Book cover image courtesy Thames & Hudson.